Given the dearth of posts on this blog lately, this will come as no surprise, but I’ve decided to bring FRN to a close. I have increasingly found myself stretched a bit too thin over a few too many projects. To borrow a relevant cliché, I’ve run out of steam. As if melamine in cat food wasn’t enough. Two weeks ago, the U.S. Consumer Products Safety Commission issued a recall of wooden Thomas and Friends toy trains that the toymaker’s Chinese manufacturers painted with lead paint despite instructions to the contrary. The New York Times points out that “[u]ntil a few decades ago, lead-painted toys were as American as the Little Dutch Boy, the National Lead Company emblem who cheerfully extolled the virtues of pure lead paints for homes, cars, water tanks and toys.” The U.S. has been trying to get the lead out of virtually everything — paint, gasoline, pipes — but this isn’t the case elsewhere in the world. Via (and see also) Treehugger. On a related note, this Ask MetaFilter thread on how to hop a freight train is both cautionary and dangerous, in that it provides exactly everything you know: how to do it (and how not to — never jump on a moving train, apparently) and the dangers involved in doing it — both in terms of risk to life and limb (which is significant) and in terms of what happens when the authorities catch you at it. This whole thing strikes me as just nuts — too much risk for too little reward. Injecting heroin seems sensible by comparison. But there’s enough romance in it, apparently, to ensnare enough people willing to give it a try. Akash’s photo gallery of Bangladeshis riding atop freight trains: “Due to Bangladesh’s large population, inadequate seats on the trains and poverty, it is quite common to see a thick layer of people occupying the roof of a train. Frequent accidents, which occur when a free rider slips, are not enough to deter these stowaways of the railway.” Amazing shots. Via Gadling. 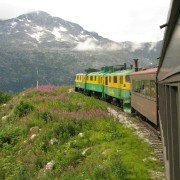 Travel blog Gadling has been running a series of posts on touring Alaska “without a cruise ship.” In today’s post, we arrive at Skagway, where, naturally, the writer thoroughly enjoys himself on the White Pass and Yukon Route: “I love train travel and this was one of the very best train journeys I’ve ever taken.” Ironically for the theme of the series, the railway is a major attraction for cruise ship passengers, and would likely not be in service without them. Previously: Narrow Gauge Tourist Railroads. Rebuilding and expansion will keep fare increases above inflation for the time being, the Guardian reports: “The government will unveil a multi-billion pound rebuilding programme for the British rail network this summer to ease congestion on the most crowded lines. … However, the government has warned that inflation-busting fare increases will continue for the foreseeable future. It is ordering 1,000 extra rail carriages to cope with rising passenger numbers and it expects fare increases to cover much of the £1bn cost.” Via Treehugger. Cardhouse’s tips for travelling cross-country by train pulls no punches about the shortcomings of Amtrak — or the shortcomings of fellow passengers, for that matter. Practical if a wee bit cynical. Still seems to prefer it to flying: “Anyway, on a train you can get up, stretch your legs, walk up and down the train cars making furtive eye contact with people who are working on their deep-vein thrombosis projects.” Via Kottke. 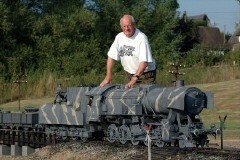 Model Railroader senior editor Carl Swanson is the new editor of Classic Toy Trains, Kalmbach announced last Friday. Via OGaugeWatch.com. Previously: Besougloff Is New MR Editor. Large-scale models can be awfully impressive. For proof, go to the forum of the UK 1/6th Collectors Club — that’s 1:6 scale, or 2 inches to the foot — for a series of magnificent photos of Peter Shaw’s WWII-era Class 52 “Kriegslok” German steam locomotive (and accompanying vehicles and figurines). It’s not just the amazing models, Vince’s photography is beyond first-rate. Stunning! Our friends at Modern Mechanix have the goods on a 1933 report of a propeller-driven monorail — a French equivalent, perhaps, of the roughly contemporaneous Bennie Railplane. The plans called for a 15-horsepower engine and speeds of 155 miles per hour: try that on conventional rail! Via Boing Boing.